Name meaning 'shiny or graceful'. Buxus nitidus (Miq.) Hallier f.
Longetia malayana (Benth.) Pax & K.Hoffm. Longetia montana (Ridl.) Pax & K.Hoffm. Shrubs to trees, up to 30 m high, bole up to 6 m, dbh up to 50 cm; branchlets pale straw to greyish to greyish brown, flowering ones 2.5-4 mm diameter, somewhat wrinkled when dry. Indument of brownish hairs. Outer bark smooth to rough to broadly fissured to flaky, greyish white to (dark) grey to greyish brown to dark brown, 1-2 mm thick; inner bark pale yellow to pink to reddish brown to brown, fibrous, 5-10 mm thick; sapwood white to yellowish to pale brown, soft; heartwood pinkish brown to red, hard, dense. Leaves: petiole 4-14 mm long, slightly hairy when young, green to red; blade elliptic to obovate, 1.4-16 by 1-6 cm, length/width ratio 1.9-3.2, margin flat to recurved, with glandular dots, apex emarginate to rounded (to bluntly acuminate), upper surface slightly hairy when young, soon glabrous, smooth, dark green, glossy, lower surface hairy when young, soon glabrous, smooth, lighter green to glaucous to grey-green, shiny; venation generally indistinct to distinct on the lower surface, midrib green to brownish yellow beneath, nerves 6-9 per side. Inflorescences single to up to c. 3 together, cymose, but often thyrsoid, sericeous to subglabrous, staminate ones up to 5.5 cm long, pistillate ones up to 1 cm long, with basally several bracts; bracts triangular, largest ones 1-1.7 by 1-1.4 mm. Staminate flowers 3-4 mm in diameter; pedicel 1.7-6 mm long; sepals (3)4 or 5, ovate, the 2 outer ones 1.2-1.8 by 1-1.5 mm, the 2 or 3 inner ones 1.8-2.2 by 1.5-2.8 mm; stamens (4)5, filaments 1.3-2.8 mm long, white; anthers 0.7-1.2 by 0.7-1 mm, pale to golden yellow; receptacle hairy, yellow to orange. Pistillate flowers 2.7-3.7 mm in diameter, green to red to greenish brown; pedicel 1.5-3.5 mm long, elongating up to 12 mm in fruit; sepals 4-8, ovate, 1-2 mm high by 1.5-2.5 mm wide, apex rounded, 4 outer with 2 smaller, very thick, inner ones thinner, with membranous upper margin; ovary globose to ovoid, 1.2-3 by 1.5-2 mm, subglabrous to hairy, glabrescent, 2-4-locular; stigmas split, up to 1 mm long lobes, shortly papillate above. Fruits globose to obovoid, 10-22 high by 9-16 mm wide, wall generally thin, up to 3 mm thick; column 10-17 mm long. Seeds obovoid, 8-10 by 5-6 by 3-4 mm, shiny dark brown when dry; caruncle black when dry, consisting of straight, short papillae, up to 1.5 mm long, in a tight group. Primary forest, secondary forest, Agathis forest, kerangas, fresh water seasonal swamp, primary and secondary peat swamp forest, riverine forest, montane mossy forest; sometimes along roads and sea shore; soil: acidic sand, peat, clay; bedrock: granite, igneous intrusives, sandstone. Altitude: Sea level up to 2200 m. Flowering and fruiting: whole year through. Fruits eaten by monkeys. 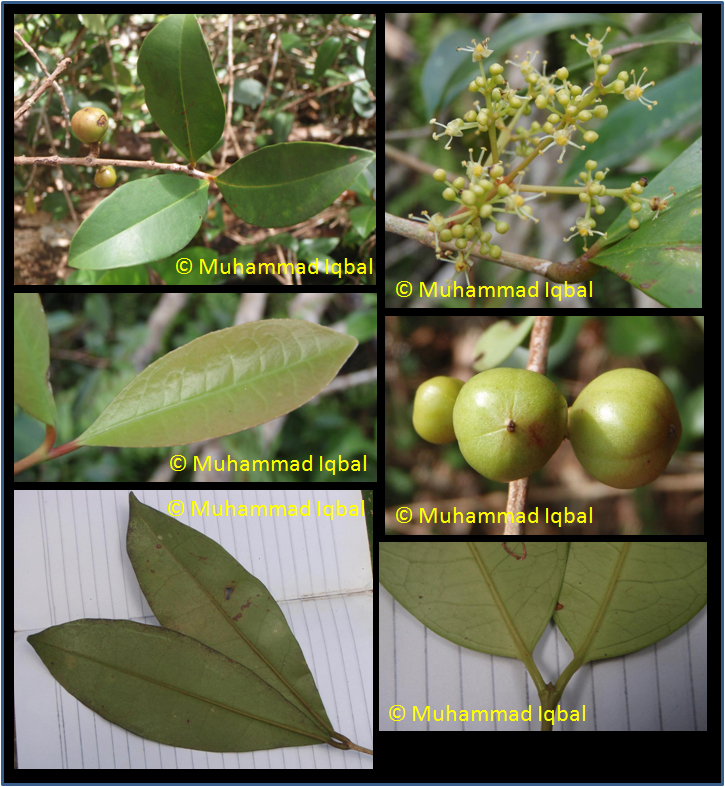 Sumatra: Fruit produces edible oil. Borneo (Sabah): Wood uses for construction purposes (Bajau). Peninsular Thailand, Malay Peninsula, Sumatra, Borneo. Borneo: Kalimantan: Kalek lilin, Kasoe; Sabah: Oba suluk (Brunei); Oba sapan(g); Parapat; Susu-sudu (Bajau); Sarawak: Rabong, Ubah banih. Sumatra: Haoendoloksapot; Kalek manoendjang; Tamasoe harangan; Tonggi tonggi.